Mallow is one of Ash's school companions. She focuses on the Grass-type Pokémon. She is an incredibly friendly person and was quick to welcome Ash into the school but is very energetic. She is a talented cook and helps out in the Aina Cafeteria in the school. 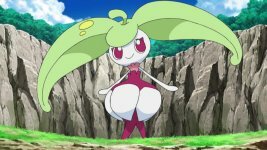 Mallow's Steenee evolved into Tsareena after dealing with Team Rocket during a PokéDance competition. After evolving, it had the strength to face off against Team Rocket. It has the powerful move Trop Kick as well as Sweet Scent at its disposal but its true battle capabilities are unknown. Evolved in episode: Won't You Give us a Dance Dance Evolution? 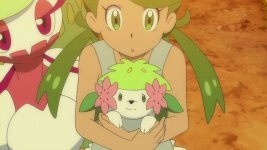 Mallow found Shaymin on Poni Island after Tapu Fini's mist made her see her departed mother. After the mist cleared, Mallow found Shaymin. She decided to look after Shaymin until it changes form and can fly away. Mallow's Bounsweet evolved into Steenee during battle with Team Rocket. Once it had evolved, it was far more capable a battler, with various moves including Magical Leaf and Double Slap at its disposal. In addition to its battle strengths, Steenee still helps Mallow out at the Aina Cafeteria. Evolved in episode: A Seasoned Search!